Two thumbs up for “How to Train Your Dragon”. The movie is based on the books by Cressida Cowell. 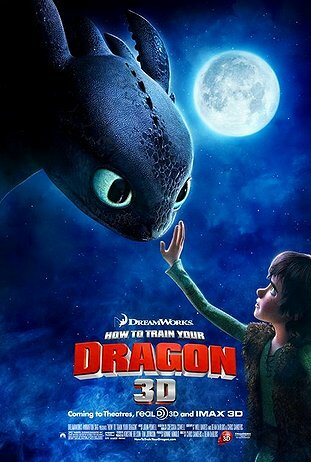 It is about a young geeky viking, Hiccup, who wants to fill his dad’s shoes as a dragon hunter. Everyone in the community often embarrassed by Hiccup. He befriends a dragon named Toothless and was able to learn new things about dragons from a different perspective. It is very interesting to see the different types of dragon animated creatively with each its own specialty feature. Jay Baruchel and Gerard Butler did a fantastic job doing the voices of Hiccup and Stoick. Gobber (Craig Ferguson) is such a lovable and comical character in the movie. Watching the movie in 3D makes it totally worth it especially during the flying lesson between Hiccup and Toothless.